From employee training to customer care, we are qualified to help you select the comfort system that fits all of your needs. We also offer a wide array of maintenance contracts tailored for your heating and cooling system requirements. We install and service a complete line of innovative products we are so sure you can depend on that we back them up with a 1-year parts and labor warranty. The certification of your independent Trane Comfort Specialist™ indicates a Trane dealer of the highest standards. Certified independant Trane Comfort Specialists™ are committed to excellence in every avenue of their business. Only dealers committed to customer satisfaction and continuing education are able to qualify as certified Trane Comfort Specialists™. When you see the Trane Comfort Specialist™ identification, you can feel confident knowing that you'll receive service from a highly trained, dedicated Trane dealer of the highest caliber. Not every dealer is an independent Trane Comfort Specialist™ dealer. Choosing a Trane Energy Star comfort system assures homeowners of lower energy consumption, improved indoor air quality, attractive design appearance, and most importantly, improved comfort for your home. Let us help you decided on the option best suited to your needs. 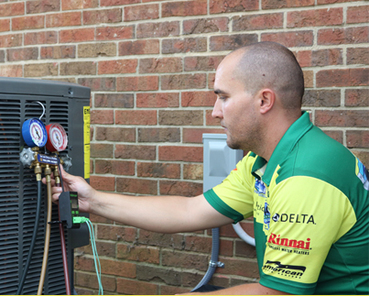 Call your local independent Trane Comfort Specialist™ today at 336-294-2301.